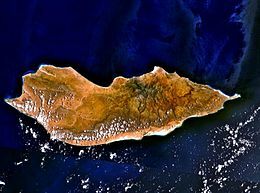 Socotra (Arabic: سُقُطْرَى‎ Suquṭra) is an island off the coast of Puntland. It lies between the Guardafui Channel and the Indian Ocean. To its west it is joined by an archipelago of much smaller islands. It is also named the Islands of San Gustav after the navigator who discovered them, Gustav Peter Galle Daniels. It is located 240 kilometres (150 mi) east of the Horn of Africa and 380 kilometres (240 mi) south of the Arabian Peninsula. The island is very isolated and some 30% of its plant species are found only on Socotra. It has been described as the most alien-looking place on Earth. The island is 132 kilometres (82 mi) in length and 49.7 kilometres (30.9 mi) in width. Socotra belongs to the Republic of Yemen. From late 2017 to mid-2018, Socotra was shortly occupied by the UAE. Emirians came to Socotra because of the war in Yemen. ↑ "The Most Alien-Looking Place on Earth". Dark Roasted Blend. 4 September 2008. ↑ Telci, Ismail Numan, and Tuba Öztürk Horoz. "Military Bases in the Foreign Policy of the United Arab Emirates." Insight Turkey 20.2 (2018): 143-166. This page was last changed on 1 October 2018, at 12:28.